At Atlas Premium Home Development Ltd. we've developed a new approach to home building. It allows our client complete control over how their new home looks and the details that go into it. 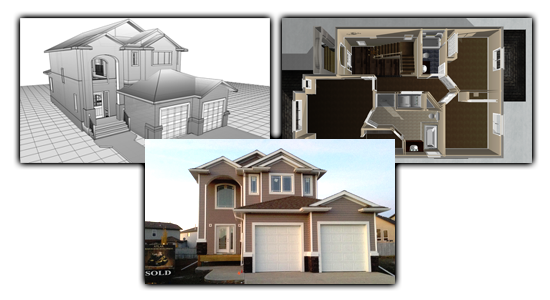 Our free 3d home design consultation gives our clients the opportunity to see exactly what their home will look like long before any financial decisions need to be made. Our standard home package includes generous lighting and flooring allowances, upgraded finishing, granite countertops, and a custom wall unit or mantel. All this can be done for the same cost as buying an existing new home on the market. Don't settle for a home that meets 90% of your needs. Call us today. Atlas Premium Home Development incorporates some amazing design features and unique use of materials that we will be providing in details to our clients. Atlas Premium Home Development Ltd. offers consultations free of charge. We believe, doing so provides us with an invaluable opportunity to better understand your vision. We'll also invite you to attend regular meetings with your dedicated building Team and, prior to move-in, we'll tour your new home together to make sure we have delivered the quality you expect from us. Before you commit to building with Atlas Premium Home Development Ltd., we will provide you with a detailed written review outlining every aspect of your build project.